Carpenter Ants are considered an important species that helps in the balance of nature as in one way it helps in the decomposition of decayed woods. But, the same species tend to be annoying and a nuisance when it invades living premises of humans. Studies state that control strategies differs with ants based on their biology and behavior. If you wish to exterminate these ants in your living places do acquire some knowledge about them. Carpenter ants are the largest among other ant species. Its size ranges typically from 3.4 to 13mm long. Like wasps these ants are also social insects that live colonies. They are often spotted in black or red in color. The physical differentiation that it different from normal ants are its petiole and thorax. Carpenter ants have one petiole and evenly rounded upper thorax. More importantly, parent colonies may be located outside the structure with satellites located within. Contact us for professional management options. Carpenter ants live in colonies that have a queen and worker ants. They have the capability to live in versatile conditions and often make their colonies in rotten trees, tree roots, tree stumps and logs. These ants are efficient underground drillers they can easily make passage from their nest to available food destination. Generally, the worker ants carry food to the nest and they tend to store it before the onset of winter season. These workers leave colony in the afternoon and returns back in the early morning. Queen usually take care of the colony and continues laying eggs. When the colony gets larger, swarmer a kind of winged reproductive are produced and this can be generally witnessed during March- June. Carpenter ants tend to collect sources of protein and sugar as their food- specifically sweets and meats. They highly feed on sugar syrup, jelly, honey and other sweet particles. They are extremely attracted by aphids, a kind of chemical that is present in sugar substances. The immediate sign that gives indication is the presence of winged ants i.e. swarmers that can be spotted inside a building or home. If Wood debris or holes are spotted, it indirectly signs the presence of ants as they would make tunnels for their passage. Sometimes the deadly parts of ants can also be noticed in the corners of window and door. Faint rustling noise is a unique sign that confirms the presence of carpenter ants. Carpenter ants tend to make their nests by aggressively digging into the wood. They make passage and tunnels extending it to their target destination by easily excavating woods that are damaged by water or other wood decay. Once they make little fissure they are capable of making it into large crater. Also they make situation horrible by making nests in wall voids, hollow doors and insulation. They infest on buildings and tend to expand their colonies huge on a larger scale. As baits and counter spray turn to be ineffective in treating carpenter ants some of the other effective control measures need to be employed in causing extermination of this species. Dust formulations show high impact in inhibiting its spread. Pyrethrins, cyfluthrin, deltamethrin and carbaryl are high used to control its colonies especially in treating wall void. Even on employing effective control measures only the specific colonies of the ants can be cleared as the other worker ants can spread to other places in expanding newer colonies. To treat this kind of infestation ‘transfer liquid insecticides’ are highly used. It does not kill the carpenter ants immediately instead it transfers to other members of the colony. The method works well in controlling carpenter ants extensively. Call us today for ant extermination and management in Greater Vancouver. Call us for an ant inspection at 604-805-0278 to learn about all varieties of ant control in Vancouver area – New Westminster, Burnaby, Coquitlam, Maple Ridge, etc. 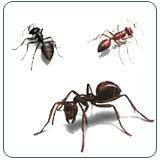 Call 604-239-1615 for an ant exterminator in Delta, Surrey, White Rock, Langley, Richmond, or Tsawwassen.